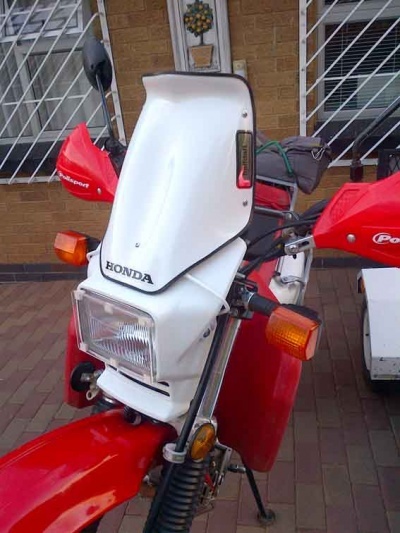 These luggage racks are delivered complete with a left and right hand tubular brace to go on the inside of the mudguard, from the foot rest mounting point, up to the rear rack mounting point, for additional support. The racks utilise the saddle strap mounting points and in conjunction with the braces, triangulate the mounting of the luggage rack to spread the load over a larger area of the frame. 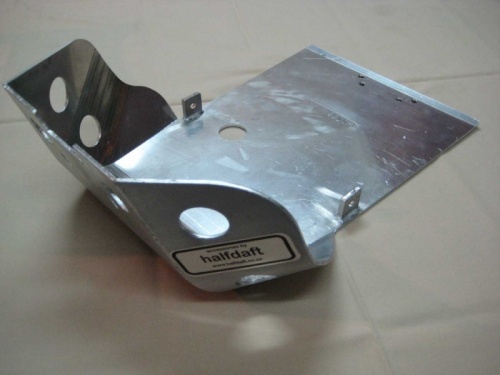 The cross bars are 25mm by 5mm flat bar to better facilitate the mounting of a top box or other equipment. 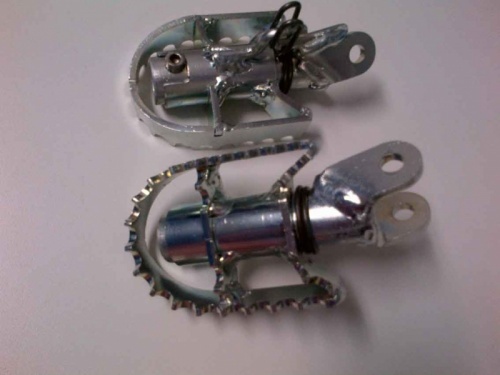 Includes all additional nuts, bolts, washers and mounting instructions for easy fitting. Powder coated in a choice of Silver or Satin Black. 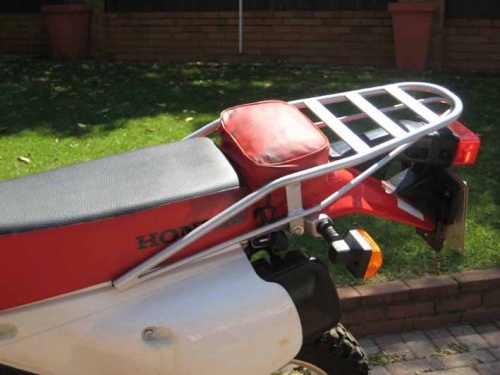 Honda XR650L Long luggage rack which allows access to the tool bag in the standard position. A short version is available on request. 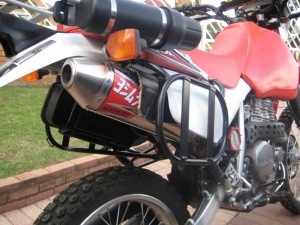 Honda XR650L, XR650R and New Africa Twin (CRF1000L) extended footrest. 60mm Wide by 80mm long extension fitted over the original 35mm wide by 65mm long footrest. More comfortable when standing up, reduces fatigue on the feet by spreading the load over a wider area. 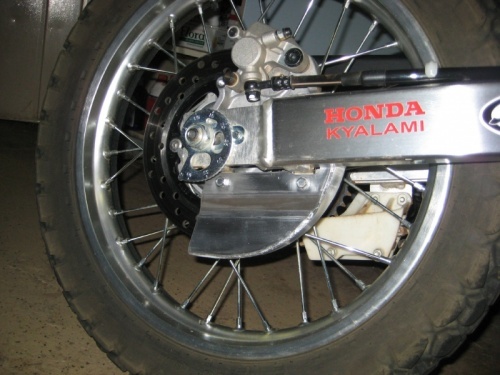 Also available with the extension offset to the rear of the bike. 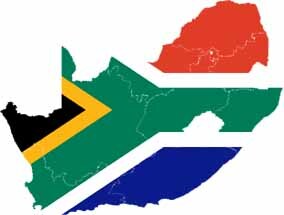 R 365.00 per pair plus the exchange of your original pair of footrests. 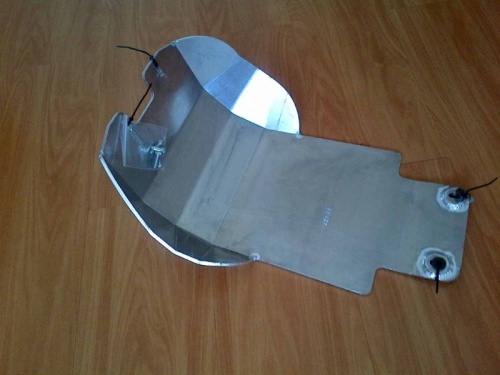 Honda XR650L, XR650R rotating footrest. 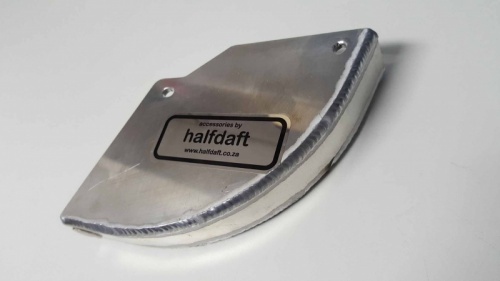 60mm Wide rotating footrest. Includes new mounting pins, washers and split pins. R 1,254.00 per pair . 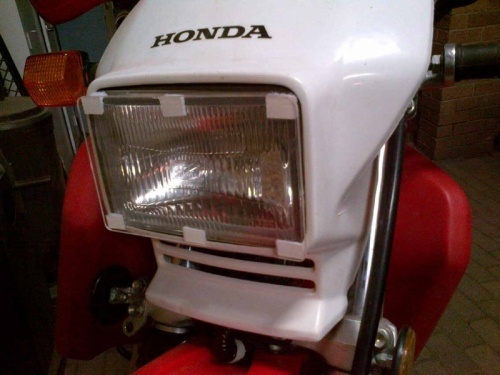 This replacement aluminium copy of the original Honda XR650L/R plastic unit bolts straight on and offers protection far superior to that of the original. This protector is more rigid and less susceptible to damage by flying stones and debris. 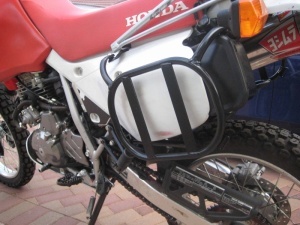 Honda XR650L 4.5 mm aluminium engine protector shown above. Bolts on in place of the original tubular protector. Honda XR650R 4.5mm aluminium engine protector shown above. Bolts on in place of the original unit. 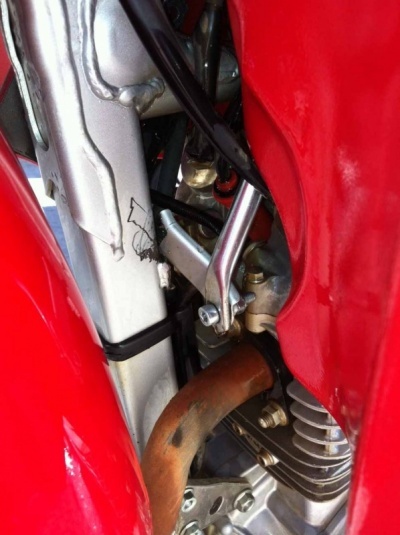 Reduces the possiblity of the alternator cover being punctured by the gear lever, should the bike fall over on the left hand side. 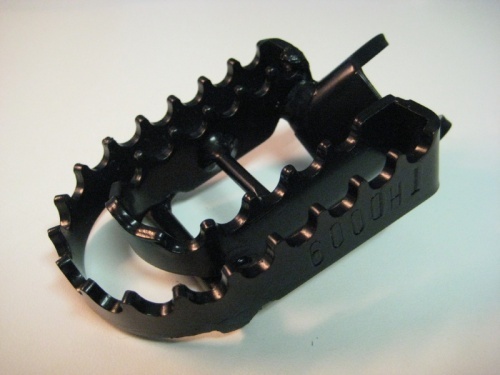 Supplied with longer bolts to mount. Please specify whether or not a Sutton oil cooler is fitted when ordering. To order please use the contact form at the bottom of the page. 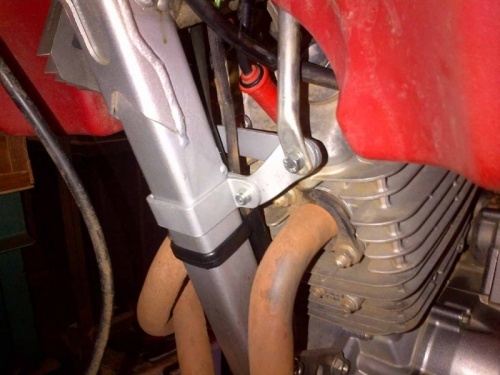 These brackets are designed to relocate the Honda XR650L front indicators for clearance when an Acerbis long range tank is fitted. R 126.00 per pair excluding delivery. Used to block off the Honda XR650L exhaust injector ports and air cleaner suction connection when removing the smog pump. Available for the XR650L in clear or orange, with Velcro mounting pads. Clear R 137.00 excluding delivery. Orange R 160.00 excluding delivery. The XR650L Acerbis long range tank relies on using the lower tank mounting brackets for stability. These sometimes crack and break off resulting in an unsupported tank. An example shown above. This bracket is a bolt on solution to the problem. The remaining parts of the original bracket will need to be cut off to install this replacement bracket. Made from 3mm steel and painted to match the frame. Can be fitted with or without the Luggage Rack. 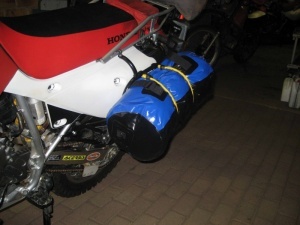 Protects plastics from damage by saddle bags and being squashed on to the hot exhaust. 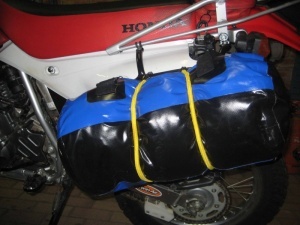 Can also be used to strap bags directly to as shown above. Strap mounting points provided on each of the bottom corners. Fibreglass screen with mounting brackets. 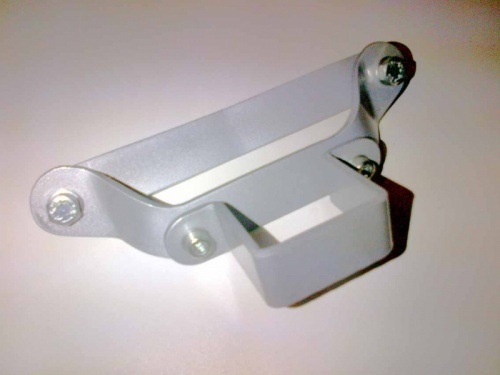 Screen mounting bracket incorporates indicator relocation for use with an Acerbis tank. Seat Concepts products are made and developed in the U.S.A. by true motorcycle enthusiasts. We ride and race what we sell. 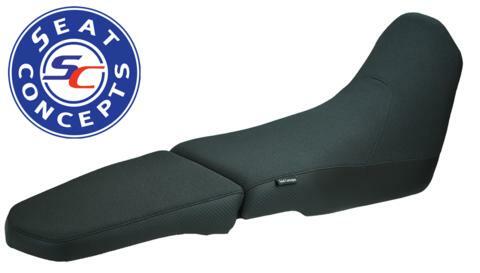 Full seats and foam & cover kits available in a variety of choices for most makes and models. Please contact us for further details. The contact form does not always seem to work, please use the email address above. Thank you.